Sub: Clarification on date upto which enhanced family pension payable-reg. Ref: CPAO ID No. CPAO/IT & Tech/Clarification/13(VOL-III)/P&PW/2017-18/193 dated 05.02.2018 and NIC Note, dated 3.4.2018. CPAO may please refer to above mention ID, dated 5.2.2018 on the subject mentioned above. 2. It was decided to increase the age of retirement from 58 to 60 years vide its notification No.25012/2/97-Estt. (A) dated 13th May, 1998. 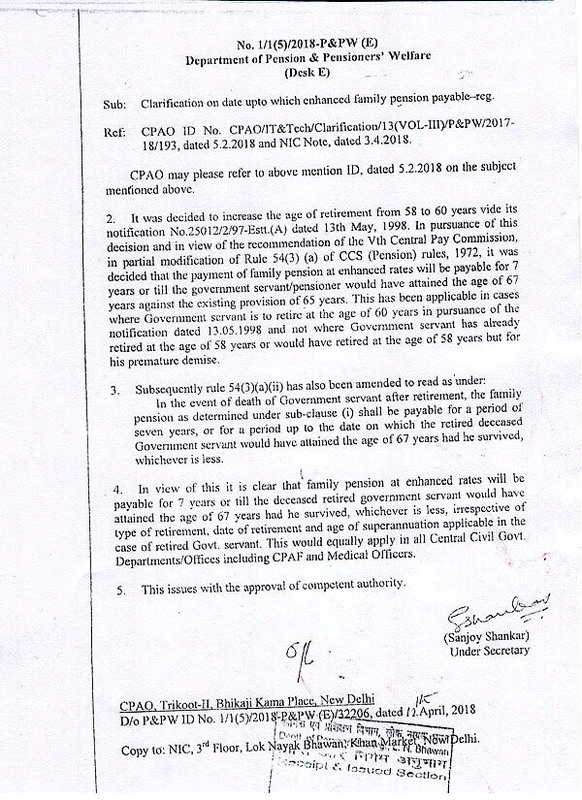 In pursuance of this decision and in view of the recommendation of the Vth Central Pay Commission, in partial modification of Rule 54(3) (a) of CCS (Pension) rules, 1972, it was decided that the payment of family pension at enhanced rates will be payable for 7 years or till the government servant/pensioner would have attained the age of 67 years against the existing provision of 65 years. This has been applicable in cases where Government servant is to retire at the age of 60 years in pursuance of the notification dated 11.05.1998 and not where Government servant has already retired at the age of 58 years or would have retired at the age of 55 years but for his premature demise. In the event of death of Government servant after retirement, the family pension as determined under sub-clause (i) shall be payable for a period of seven years, or for u period up to the date on which the retired deceased Government servant would have attained the age of 67 years had he survived, whichever is less. 4. In view of this it is clear that family pension at enhanced rates will be payable for 7 years or till the deceased retired government servant would have attained the age of 67 years had he survived, whichever is less, irrespective of type of retirement. date of retirement and age of superannuation applicable in the case of retired Govt. servant. This would equally apply in all Central Civil Govt. Departments/Offices including CPAF and Medical Officers.